A few months ago I argued consumption, specifically Actual Individual Consumption, is an exceptionally strong predictor of national health expenditures (NHE) and largely explains high US health expenditures. I found AIC to be a much more robust predictor of NHE than GDP and at least an order of magnitude stronger than other components of GDP when disaggregated (collectively and separately) in multiple regression analysis. They believe it cannot be a coincidence that the country that spends so much more than expected (according to naive expectations) also gets worse outcomes than expected and generally gets worse outcomes than the most developed countries of predominantly European and Asian origin. In this blog post I will address the so-called “outcomes” dimension and explain why these apparently sub-par outcomes are not only not otherwise inexplicable, but can actually be explained in a fairly straight forward and parsimonious fashion For the moment, I will narrow my focus on the subset of factors that drive US health outcomes significantly below naive expectations (not necessarily the full residual) and that I have good reason to suspect are significantly causally related to the expenditures issue. Later, perhaps in another lengthy blog post, I will address other factors that are mostly orthogonal to expenditures and that further affect US health outcomes. 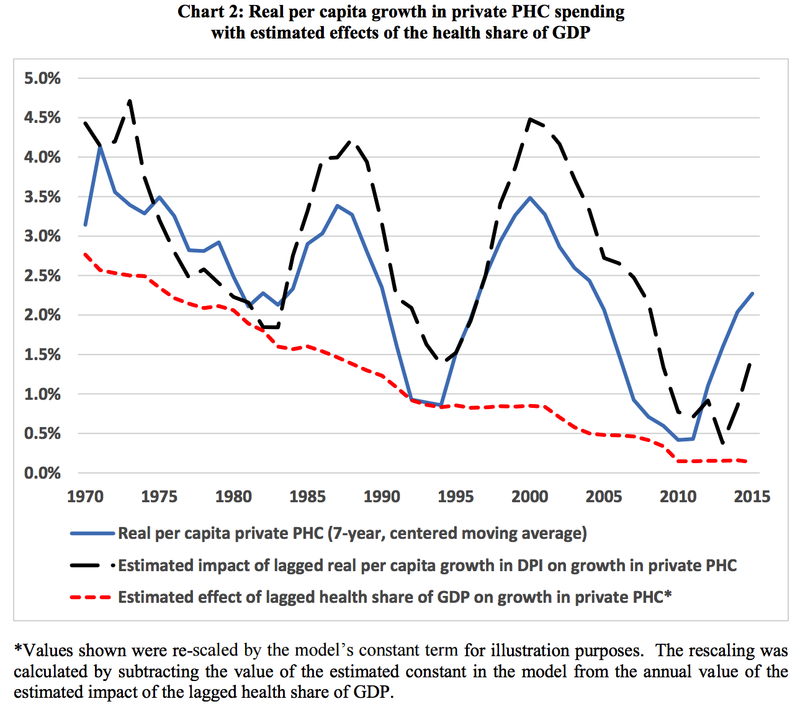 In my prior post, wherein I argued at length that US health care expenditures are reasonably well explained by Actual Individual Consumption (AIC) and that GDP is an inferior predictor, I pointed out toward the end that the linear specification I used is likely to significantly overstate US residuals because there is good evidence for non-linearity and because the US is far out on the frontier vis-a-vis consumption. This non-linearity can be seen pretty clearly if you look at the 2011 data derived from the World Bank (for AIC) and WHO (for HCE). Since some people may (1) doubt the accuracy of these statistics outside of the few highly developed countries (2) imagine that these poor countries are somehow qualitatively different in a way that’s not well correlated with their level of economic development or (3) are particularly reluctant to accept non-linearity as a potential partial explanation for the US here, I thought I’d approach this from a somewhat different angle. 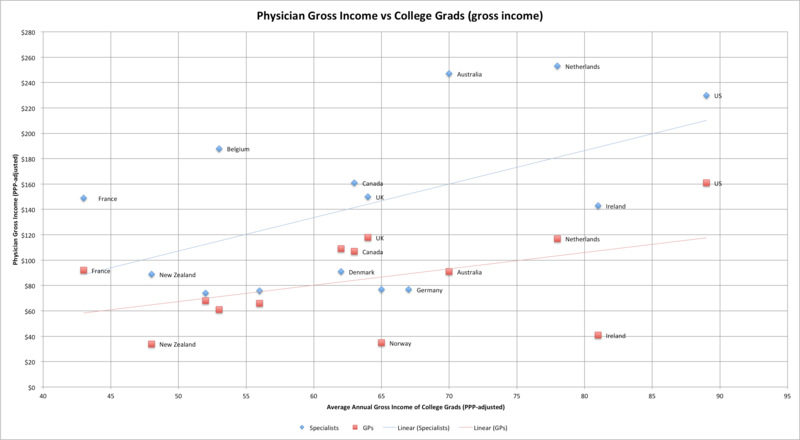 About two years ago I created a long blog post arguing that the United States is not an outlier in healthcare expenditures per capita. Following renewed interest from a link from Marginal Revolution recently and some criticism from a few people on various comment threads, I thought I’d take the time to update the evidence, address some areas of criticism, and muster yet more lines of evidence to support my argument. This post should largely make the earlier post obsolete, but I will keep the earlier post up for posterity and to retain data/information that won’t necessarily be perfectly duplicated in this post. Edit (12/12/18): I recommend reading this newer post instead if you’re haven’t heard from me before on this topic. There exist several popular plots like these that people use to make the argument that the United States spends vastly more than it should for its level of wealth. GDP is a substantially weaker proxy for “wealth” and a substantially weaker predictor of health care expenditures than other available measures. 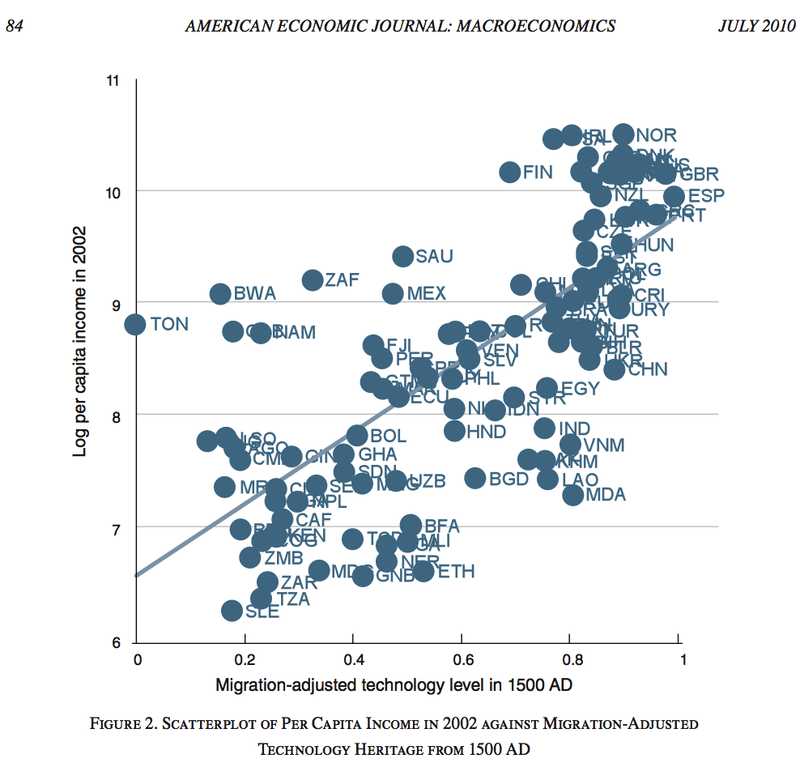 The US is much wealthier than other countries in these plots in reality. Comparing these two quantities with a linear scale tends to substantially overstate the apparent magnitude of the residuals from trend amongst the richer economies when what we’re implicitly concerned with is the percentage spent on healthcare. When properly analyzed with better data and closer attention to detail, it becomes quite clear that US healthcare spending is not astronomically high for a country of its wealth. Below I will layout these arguments in much greater detail and provide data, plots, and some statistical analysis to prove my point. 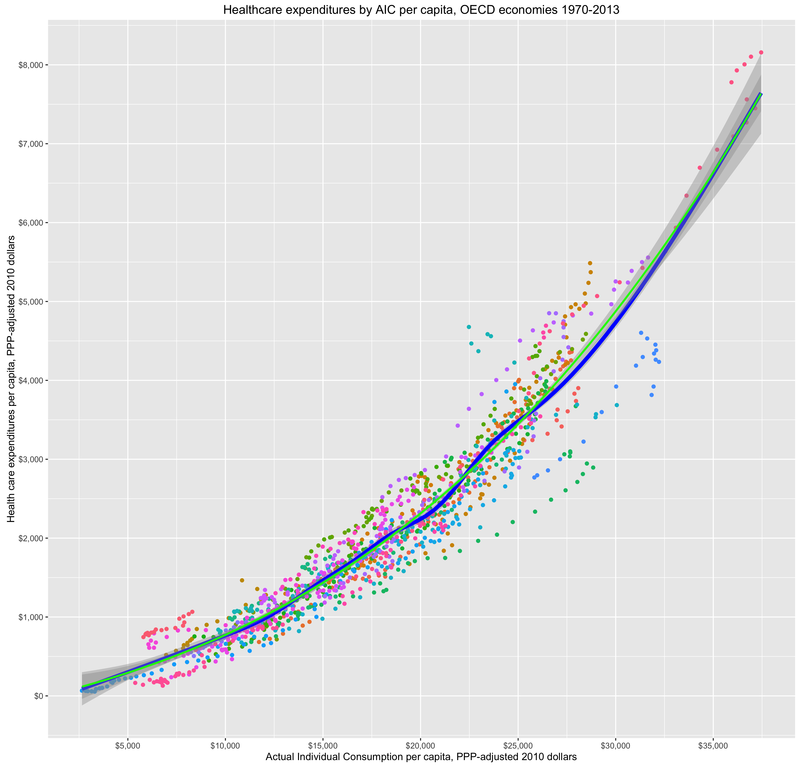 National Healthcare Expenditure: United States versus Other Countries: The US is not really an outlier. 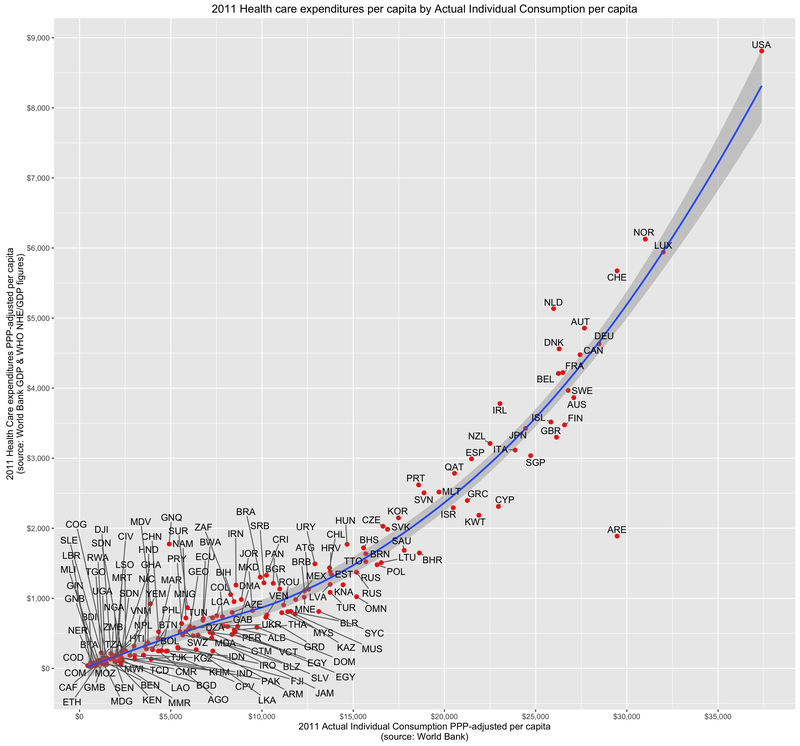 November 24, 2014 September 25, 2016 by rcafdm14 Comments on National Healthcare Expenditure: United States versus Other Countries: The US is not really an outlier. UPDATE (9/25/2016): I just created a new and (hopefully) much improved version of this argument here. I suggest you start there instead. Numerous people have asserted that the United States spends dramatically more on healthcare than other countries, presumably even more than countries of our level of wealth and affluence, and that this can only be explained by the fact that we do not have single-payer or some such. I knew the proponents of single-payer were, at best, making an incomplete argument and that it invited an exaggerated impression of what we should likely expect from a country like ours, but, up until now, I lacked the data and the time to present these argument comprehensively. I recently got in an argument with someone over this subject and found a treasure trove of data all in one place (mostly) to thoroughly debunk this overly simplistic argument. Note: In both cases, “gross” is pre-tax income, including social security/payroll contributions.